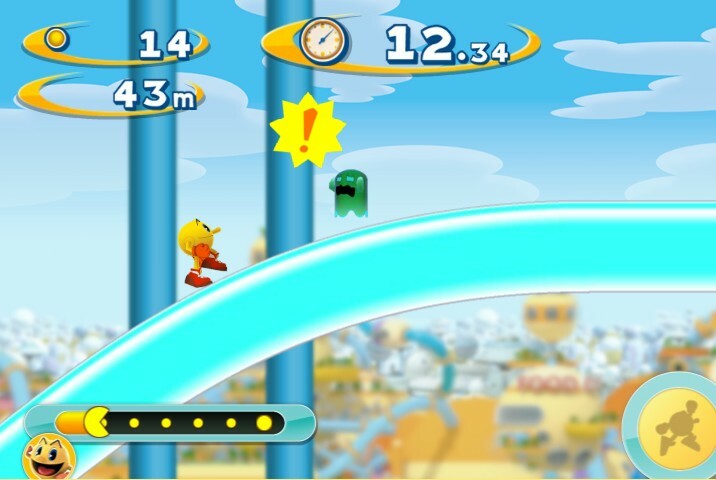 Pac Man Dash refers to a great Android / IOS title were Pac Man gets a fresh new look and also has the chance to step out of the maze for the first time in an official game release. The current title features Pac Man as a charismatic humanoid type of character a lot faster and more powerful then his 8 bit version from the arcade coin operated cabinets era. 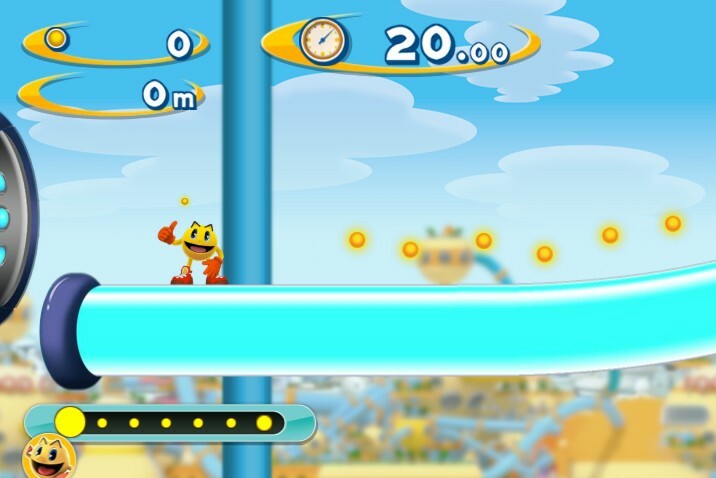 Pac Man Dash is build in the form of a nice platform runner that looks like it’s working on autopilot as the player that control Pac Man only needs to push two buttons, one for jumping and the other to perform a nice Dash once your energy bar is charged at it’s maximum. Pac Man acts a lot braver then it did in it’s glory days and manages to intimidate all the ghost immediately after they spot it. 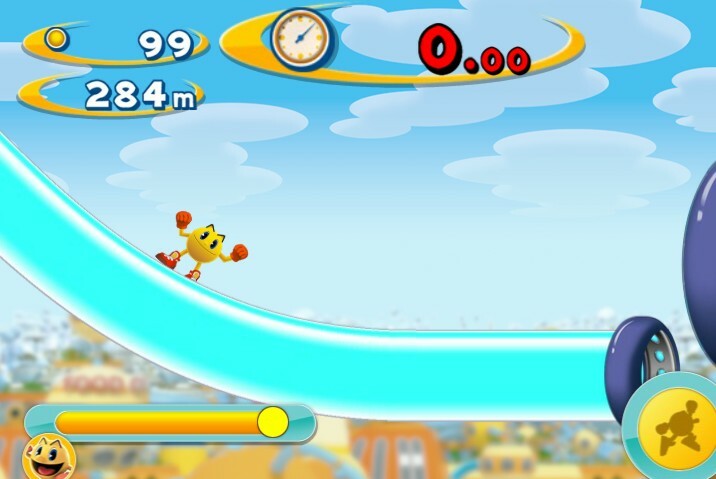 Gone are the days where he needed to collect the big magic dots that gave him the ability to hunt down after his opponents, in this modern version of the game the role are reversed and Pac Man can concentrate on his main mission of collecting enough googles and advance further before the countdown timer reaches zero. Actually by eating the ghosts Pac Man get’s precious bonus seconds that are truly necessary to help him complete his task. Each stage requires you to complete some given tasks in order to unlock the next one such as achieving a fixed number of dots, capturing enough ghosts or completing a runaway course over a distance milestone. 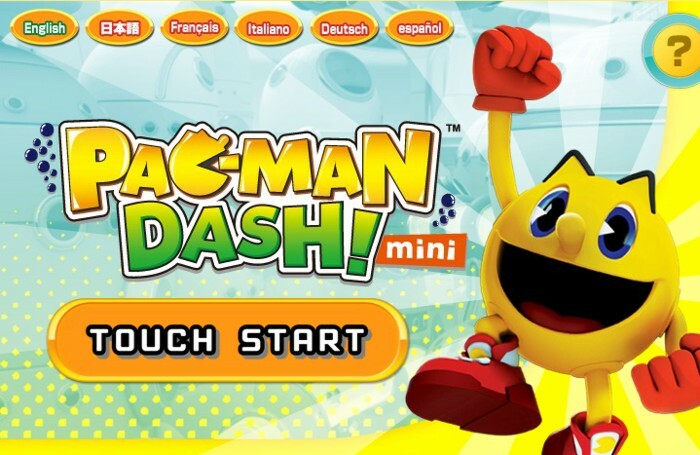 Well this short introduction was all about the original game built for the mobile market, yet I doubt that many of the actual mobile version players probably know that Namco Banday also released a mini flash game version for Pac Man Dash that is available to be played freely online. The flash version dedicated to browser playing for desktop computers comes as a really nice polished title that will attract the eyes of the hungry flash based games players in second. While this mini version could be considered as a short spoiler for the original, I doubt this was the intention of the developers. Actually I believe this was a great marketing strategy in order to attract web players attention’s and have them download the Android or IOS version that also runs a buy upgrades by spending real money system. The flash version is short enough to let you scream for more as you only have about 20 seconds or so dedicated to playing. You main goal is obviously to collect enough dots to fill the energy bar displayed in the lower left corner of your screen before you run out of time. There are several paths inside and outside the glossy transparent blue tubes that you can follow while trying to complete this and as you will probably observe by your own is better to choose one over the other. Once you start you became addicted pretty fast as you will probably need to restart over and over before mastering your skills. Besides having the game released on Itunes and GooglePlay the developers also build a dedicated website for this game kind of to show off and to let people know they are taking this seriously by taking the Pac Man legacy further into to the modern era of mobile gaming. Namco also released Pac Man 256 a year back, yet there was no dedicated website built for this game. Having all these said you should really try the game for yourself.